Looking Back on 2018...ARYSE has come a long way! We have grown from hosting 1 program to hosting 4, over 150 youth served annually, and we’ve broadened the conversation in our community about what it means to support immigrant and refugee youth. But of course, there is still a lot of work to do. In addition to seeing our students at PRYSE Academy and during weekend and after-school programs, we envision becoming a support system that is with our kids on every step of their journey: from the time they arrive in the U.S. and throughout their process of integration. At ARYSE, we are kicking off 2019 with energy, focus, and determination! We are so proud of our students and grateful for the generous support and encouragement of our volunteers, donors, and foundation partners. Girls Art and Maker Group is a monthly meetup for immigrant and refugee teen women to create art and share stories, build community and leadership skills, and gain mentorship. The program combines creative expression workshops, facilitated dialogue sessions, professional development activities, and field trips to art studios, cultural events, and landmarks throughout the Pittsburgh region. Through the program, participants develop friendships, engage in art-making workshops to share stories, become part of a larger network of refugee women and artists in the Pittsburgh region, gain mentorship from peers and caring adult women facilitators, and identify strategies for managing stress and opportunities to overcome barriers to achieving success. 1. Create a safe and supportive space for young immigrant women to express themselves and their shared experiences. 2. Use a variety of art forms as a way to explore a variety of issues and topics that are important to the participants. 3. Gain mentorship from peers and caring adult women of color who facilitate the program. 4. Develop the leadership skills of the participants by providing them with spaces to sell and showcase their art. In 2018, ARYSE launched its first after school program in partnership with JFCS Refugee and Immigrant Services and the Islamic Center of Pittsburgh. After School Club is a safe and fun space for refugee and immigrant youth of all ages living in Pittsburgh to receive homework help, tutoring, mentoring, and enrichment. The After School Club operates at two sites: one for youth in elementary and middle school, the other for high-school age youth. In addition to providing 1-on-1 homework help to support students’ academic readiness and growth, the program combines sports, team-building activities, college and career readiness curriculum, and creative expression workshops. The After School Club serves 60 youth in K-12. 2. To see our mentees develop mutual understanding and positive relationships with their peers. 3. To heal through art and storytelling workshops. 4. For our mentees to build positive, caring, and helpful relationships with caring mentors. This summer, we hosted the 6th year of PRYSE Academy! Over the course of 6 weeks, we served 81 youth from 13 different countries who, on average, have lived in the U.S. for less than 5 years time. PRYSE Academy was held in two, three-week sessions; each enrolled a different group of 40-45 students. Program activities included team and literacy-building games, classroom activities that build students’ academic readiness, sports, and creative expression workshops where students develop personal storytelling projects. 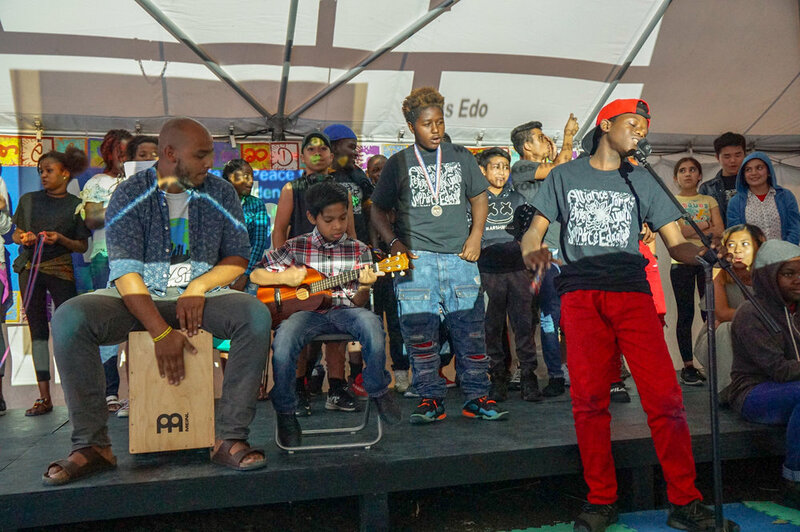 Each three-week session of the program culminated in a Final Showcase where students presented their projects and experiences at camp to a public audience hosted at City of Asylum in Pittsburgh’s Northside. 1. To improve the overall literacy skills of our mentees. In 2018, 83% of participants reported that attending the program improved their literacy skills. 2. To help our mentees build learning skills. In 2018, 88% participants reported that the program helped them feel more confident to succeed in school. 3. For our mentees to meet new people and forge new friendships. In 2018, 96% of our mentees reported making new friends. 4. For our mentees to have pride in their work. In 2018, 100% completed a personal storytelling project and 90% presented those projects on-stage at the Final Showcase. 5. To give our mentees an oppurtunity to express themselves. In 2018, 100% participants reported that PRYSE Academy gave them a space to share their personal stories. 6. For our mentees to take pride in their culture, language, and heritage. In 2018, 96% responded that they had opportunities to celebrate their language and culture. Refugee After-School Program Aims To Bridge Gap Of Language Learning In Schools. In a foreign land, these youngsters spend their Pittsburgh summer piecing together a new language and confidence. After-school program helps refugee students acclimate to Pittsburgh schools. Without the generosity of our donors and foundation partners, we could not have achieved such impactful growth in 2017-2018. At a time when it feels more important than ever to support immigrant and refugee communities, we are humbled by the growing community of passionate ARYSE supporters. Thank you for joining our movement to support immigrant and refugee youth in becoming engaged, confident, and celebrated members of our communities!